If you were wondering why Livraria Lello came to be our undisputed numero uno, then look no further than this article which should explain it all, and if you're still not impressed, why not visit it yourself and report back to us with your pros and cons. 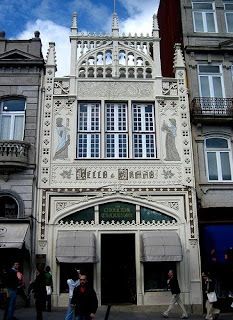 Located near Praca dos Leoes, Livraria Lello & Irmao was established in 1906 after being designed by a Portugese engeneer Xavier Esteves. This fine example of art nouveau, with its stunning facade in a late neo gothic style is also decorated with two painted figures, one representing Art and the other representing Science. 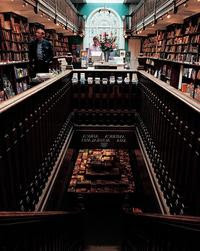 The bookstore's interior is nothing less impressive than its exterior which spreads on two levels and is connected by an amazing stairway inspired by the Parisian Galleries Lafayette. 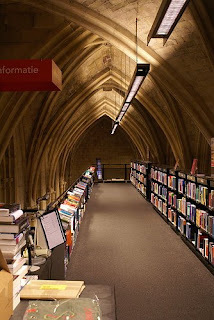 Furthermore, stained glass skylight, walls heavily decorated with carved wood, the railway track on the floor along which employees move carts filled with books are among other features of the bookstore. Even the pillars inside are decorated with bronze bas-relief ornaments of figures from Portugese literature. All in all, Livraria Lello & Irmao is one of the finest works of the “second eclecticism” style in Portugal, with beautiful art nouveau elements which, once all combined, create an amazing visual (as well and intellectual) experience indeed. 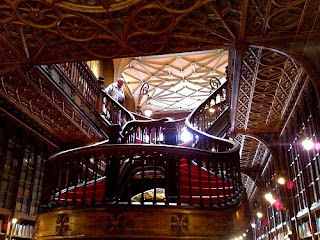 Take a tour through the Livraria Lello via this YouTube Video. 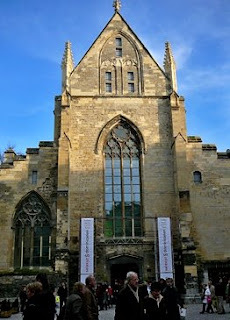 The close runner-up in our Top 5 can be found in Maastricht. Selexyz Dominicanen was opened up in November 2006 in a 800 year old Dominican church. Although it's hard to believe, the monumental building has been previously used for bicycle storage. Architects Merkx and Girod gave the interior of the store a full makeover and turned it into one of the most amazing bookstores worldwide. The task wasn't an easy one, maintaining the unique character of the church and creating a modern bookstore within its core is a true challenge. We can safely say that they have succeeded and their effort has been appreciated by all the visitors of the bookstore and also by awarding them the the Lensvelt de Architect Interior Prize 2007. Originally, the church only offered 750 m2 of floor area, which wasn't sufficient. To overcome this obstacle, a multi-floor steel structure carrying most of the books has been raised along the walls. The space problem has been thus solved by taking advantage of the monumental ceiling of the old church and using the available vertical space. The visitors can use the stairs or take an elevator and climb to the roof of the church while browsing books and at the same time admiring the majestic view below them. The interior itself is designed in a very simple and modern manner which doesn't interfere with the historical setting. The huge shelves are plain black and made of steel, the massive walls behind them are made of solid stone. The resulting effect is a pleasant contrast which enables you to fully appreciate both the modern and the historical. 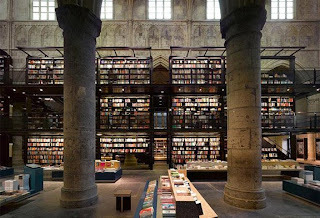 In the case of Selexyz Dominicanen, the words "sanctuary of books" are not a mere metaphor. Located in the Palazzo delle Esposizioni, the largest inter-disciplinary exhibition area in central Rome, the Bookabar Bookshop definitely deserves a mention as one of the most impressive bookstores appearance wise. The whole Palazzo has been designed by Firouz Galdo, an architect from Rome. The bookstore, accompanied by a bar, spreads on some four hundred and fifty square meters (just a little less than 5000 square feet). The fact that it's closely associated with artistic exhibitions and becomes pretty obvious upon entering, since it is a work of art itself. The surroundings seem surreal: spacious with white walls and shelves among which many books find their place, the curved ceiling with modern lightning in three rooms of which the bookstore consists, this bookstore is indeed an appeal to every eye which craves for a modern look. The snow-white interior and minimalistic design make the exposed books naturally shine and stand out in this 'one of a kind' bookstore. Being relatively new, the Bookabar Bookshop will certainly draw more attention in the future and perhaps we have made one of the first steps of placing this bookstore in a place it truly deserves to be - among one of the best looking bookstores in Europe. For the next bookstore on our list we are moving to London. The city of London has a whole collection of exceptional bookstores, and logically enough, books in English are not as rare as in continental Europe... However, our choice in the "impressive appearance" Top 5 unhesitatingly fell on Daunt Books. 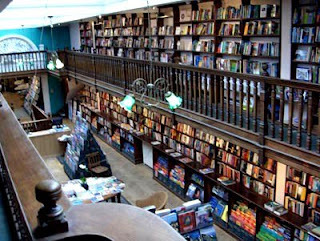 Located in central London, in the Marylebone High Street, this independent bookstore is a true gem. This bookstore almost manages to provide its visitors with a time-travel experience, since they find themselves immersed in London from the beginning of the 20th century. The elegant Edwardian interior with its almost endless rows of shelves and impressive galleries, both made of oak wood, underline the majestic look. The unique arrangement of books, where all the genres are displayed according to countries, also contributes to the overall atmosphere of singularity. Streams of natural light pouring down from the glass skylights symbolize the enlightement you're about to experience while browsig through the store's carefully selected offer. 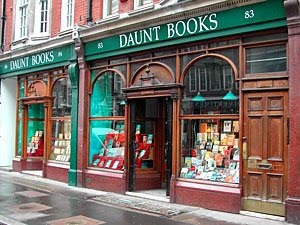 Daunt Books also maintains a strict no-music policy, which helps to create a calm ambience, so much different from the lively streets of the city. Three floors of elegance, history and knowledge and a peaceful refuge in the middle of London. See for yourself. There were several canditates for the last available spot on our list. In the end, Galignani from Paris managed to break its way through. Galignani is the first English bookstore established on the continent, and besides a rich history it also offers a aesthetic experience to remember. For Galignani, even the first impression counts, and the owner of this bookstore makes sure that once you pass by it, you will be tempted to enter. Special care payed to the window displays at Galignani is a part of the bookstore's tradition and you can check out some of their impressive captures on their website. Hidden behind old arches, Galignani is situated at Rue Rivoli since 1856 and its interior breathes with history. The long wooden shelves along with the mezzanine create an air of exclusiveness, style and elegance. The offer of the bookstore is mostly praised for its wide selection of books on art, and it is also a favorite place for many artists and fashion designers to browse. If there was a category based solely on elegance, Galignani would undisputedly occupy one of the initial positions. To view a video of the Galignani bookstore, visit their official website. Just stumbled upon your blog - such a great idea; book stores is my weakness, and your blog will certainly help my research towards my next trip!